At the pinnacle of the company’s Global Vision strategy — the reorganization of products into three distinct groups — the Art series has been designed from the get-go as an alternative to the best that the camera brands can offer. The latest model in the lineup, the 20mm f1.4 DG HSM A is intended to complement the latest high-resolution full-frame DSLRs, and incorporates a complex optical construction consisting of 15 elements in 11 groups. The company says the new 20mm is highly-corrected for sagittal coma flare through the adoption of an optimized layout and aspherical elements. 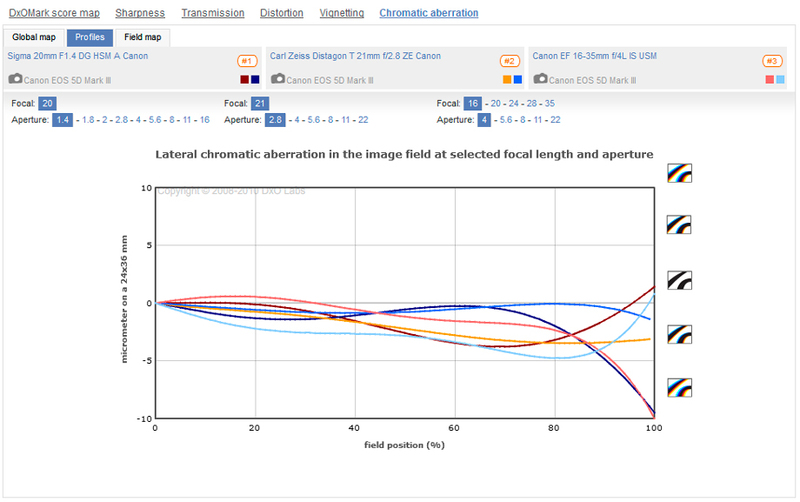 Control of axial (longitudinal) chromatic aberration was also a high priority with this model, and the company explains that it is reduced by careful matching of converging and diverging lenses; however, the 20mm also adopts two FLD (fluorite-like) elements and five ED glass elements to further reduce color fringing. Like the earlier Art series models, it has a sonic-type (HSM) AF motor for smooth and near-silent AF, with full-time manual focus override, and it is compatible the firm’s innovative USB dock, allowing AF focus tuning. Externally, it uses metal and what Sigma calls a Thermally Stable Composite (TSC) material in the construction, and appears to be on par with Canon L-series lenses in terms of build quality. 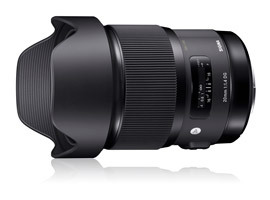 The new Sigma 20mm f1.4 DG HSM A focuses to 9.84’ (25cm), measures 3.57 x 5.11” (90.7 x 129.8mm), and weighs 2.3 lb (950g). It is available now for around $899 (USD). 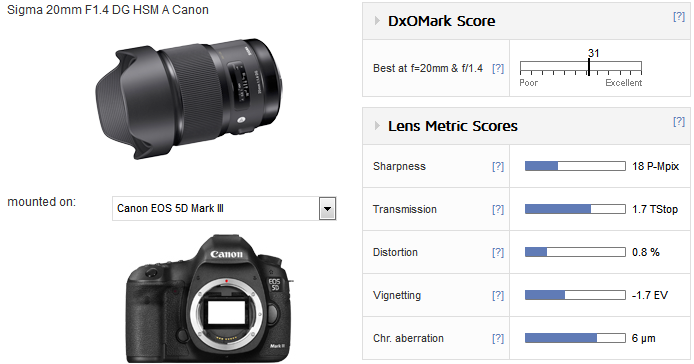 With a DxO Mark lens score of 31 points and a peak sharpness of 18P-Mpix, the Sigma 20mm f1.4 DG HSM A is an exceptional performer. It has slightly higher than expected barrel distortion, but it’s simple to correct with software. Vignetting is low. 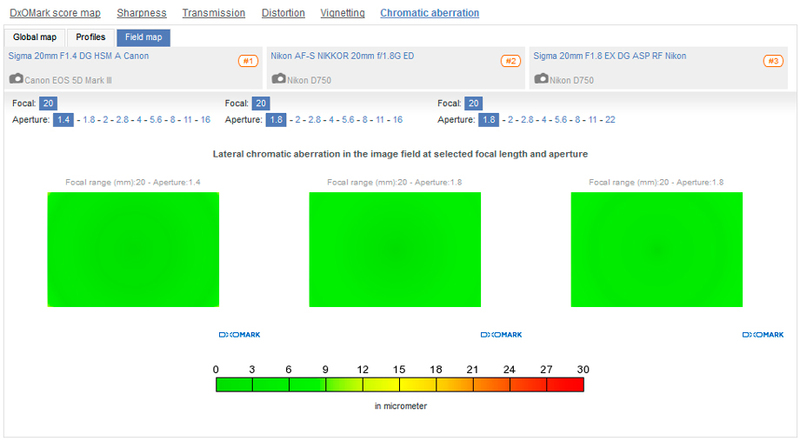 The lens has good transmission at T1.7 and exceptionally low chromatic aberration. Compared with the Sigma Art models and the 85mm f1.4 EX DG HSM (a high-performance lens and one that hardly needs updating), the 20mm f1.4 DG HSM A performs very well indeed. The new Art series model is ranked in fourth place alongside the recently-introduced 24mm f1.4 DG HSM Art overall, though it has slightly higher peak sharpness and lower vignetting. The Canon-mount Sigma tested here has to compete with a wide range of models, including some very impressive options from Canon and one with an unrivalled reputation, the Zeiss Distagon T* 2.8/21 (21mm f2.8). We haven’t tested the old made for film Canon EF 20mm f2.8, so in this instance we’ve elected to compare it with the still relatively new, stabilized EF 16-35mm f4L IS USM. But let’s not forget, the Sigma must also compete with the more specialized and less accessibly-priced EF 11-24mm f4L USM (not shown here, but available for comparison on the DxOMark site). Although discontinued now, being replaced by a new Milvus model that adopts the same optical construction and features upgraded coatings, the Zeiss Distagon can boast a similar level of uniformity as the Sigma at f/2.8 (where the Zeiss is known to perform exceptionally well). Both have slightly softer borders than centers at that aperture, though the Sigma has marginally higher sharpness levels across the field. The Zeiss and Sigma models improve at f/4, but somewhat surprisingly for a zoom, let alone one wide-open, the Canon has better sharpness across the field than the Zeiss and only just trails the Sigma. At f/5.6 and up, the Zeiss has soft borders starting mid-field as a result of field curvature, though this is less of an issue with 3-D subjects. Like the Zeiss, the Canon loses some sharpness at the periphery, but it performs well overall. The Sigma isn’t immune either, and also has some very slight astigmatism visible in our charts, and as a result, continues to perform well to the corners. 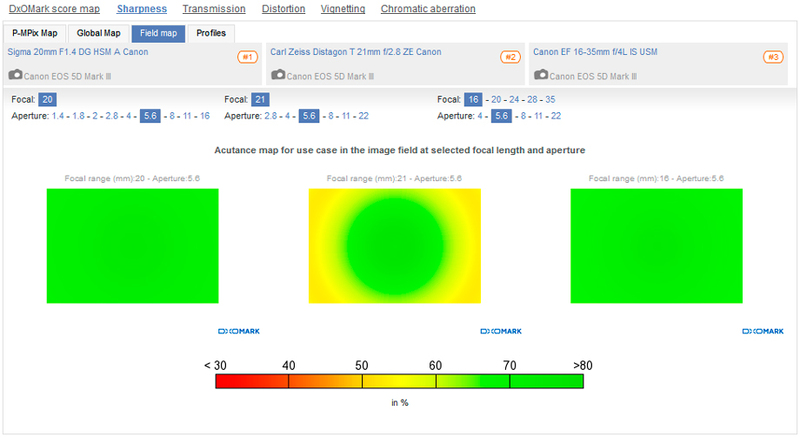 However, all three models have very low levels of chromatic aberration and the Canon has the lowest distortion at 20mm. Until only recently, third-party makers would introduce Nikon mount models first, but that’s no longer the case, and Sigma in particular produces Canon mounts ahead of Nikon. 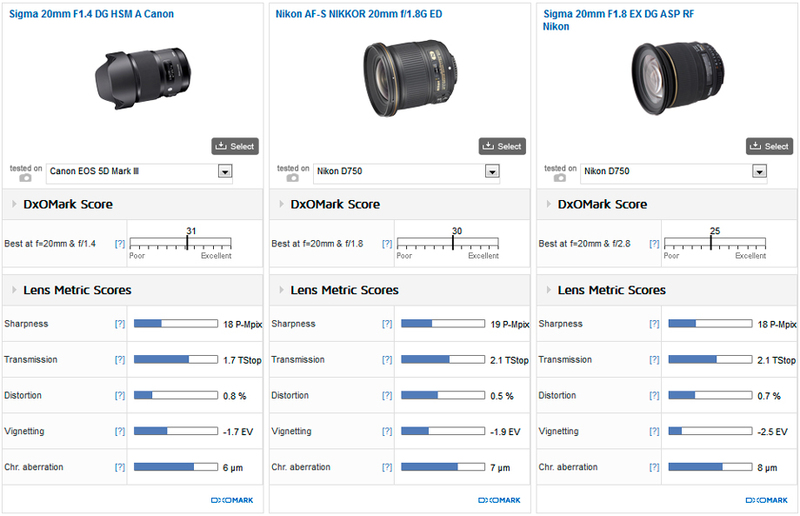 Still, we can compare the Sigma on the Canon EOS 5D Mk III with the Nikon AF-S Nikkor 20mm f1.8G ED on the Nikon D750, as well as the earlier Sigma 20mm f1.8 EX DG ASP RF, which the new Art series model replaced. As a modern lens designed for high-resolution sensors, the Nikkor has high sharpness and good uniformity, and is a very capable performer. It has slightly higher peak sharpness at f4-5.6 than the Sigma Art but the Art is a slightly better performer wide-open up to f/2, particularly in the outer field. In turn, the Art is far superior than its predecessor, at least until f/8, where the older version performs rather well. As a replacement to the Sigma EX model, the new Art model is a significant step up. 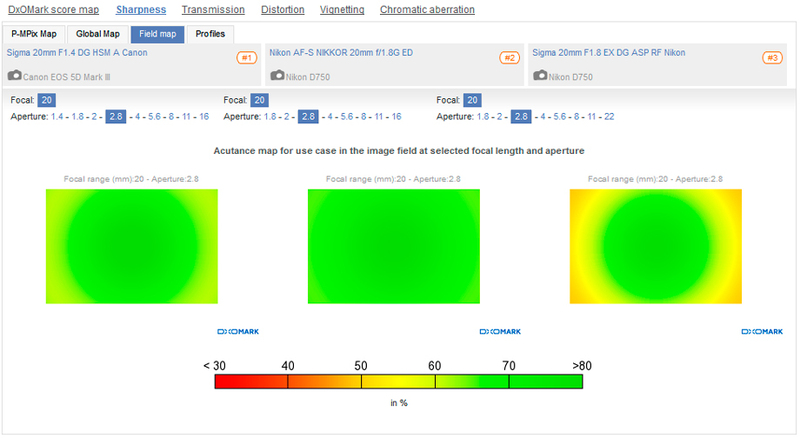 All three have equally low chromatic aberration (which in turn is more significant for the faster Art model), but the Nikkor has lower distortion. Even so, it can’t match the faster Sigma for peripheral brightness. Sigma continues to raise the bar with this new addition to their Art series primes. The new 20mm f1.4 DG HSM A compares very favorably with the Zeiss Distagon T* 2.8/21, even outperforming it when stopped down, and it looks very promising against the relatively new Nikon Nikkor 20mm f1.8G ED. Canon has yet to upgrade its old EF 20mm f2.8 from the film days, but it offers some excellent zooms that cover 20mm; however, even when stopped down, they lack the edge-to-edge sharpness of the Sigma. Of course, the Sigma is an ultra-high-speed model that’s suited to a variety of subjects, including indoor scenes with low ambient light levels, as well as landscapes, and even architecture (albeit with some easy-to-achieve correction with software). At around $899, the Sigma is competitively priced and difficult to ignore. If you’re in the market for a 20mm, this model is definitely worth a closer look.